Members of the UN Committee on Torture question a U.S. delegation at a hearing in Geneva last week. Last Wednesday and Thursday, United States government officials met with representatives at the United Nations to discuss the country’s compliance with the United Nations Convention Against Torture and Other Cruel, Inhuman or Degrading Treatment or Punishment (CAT). 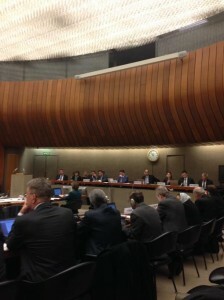 Every country that is a signatory to the CAT is required to submit a “Periodic Report” to the UN Committee on Torture outlining its adherence to the Convention, and countries are also obliged to respond to any questions, observations, and recommendations for change put forward by the Committee. The U.S.’s latest Periodic Report was submitted in October (as reported by Solitary Watch here), and last week, U.S. representatives traveled to Geneva to meet with the ten-member Committee. The Committee on Torture raised a number of issues at the periodic review, including the abuses committed at Guantanamo Bay, violence committed by police forces, conditions in immigration facilities, and solitary confinement. Each day more than 80,000 people held in solitary confinement across the United States, confined to a space the size of a parking space for 22 to 24 hours a day. There are almost no laws that regulate how isolation is implemented on the inside, whether in local, state or federal correctional facilities. At last week’s hearing, the Committee Vice-Chairperson, George Tugushi, queried American government officials about what measures were in place to limit the imposition of solitary confinement and whether alternatives were being utilized to avoid prolonged detention. Two other committee members also asked questions about the isolation endured by those locked up in America’s prisons and jails. David Bitkowe, the Deputy Assistant Attorney General at the Department of Justice, told the Commission that significant progress had been made in addressing the issue of solitary confinement on U.S. soil. He stressed that several states have undertaken reforms in recent years to reduce the use of solitary confinement without compromising prison safety, and specified that U.S. federal courts “have interpreted the Eighth and Fourteenth Amendments of the U.S. Constitution as prohibiting the use of solitary confinement under certain circumstances.” The delegation declined to specify the number of individuals who are currently held in isolation in the United States. Concluding observations and recommendations will be issued by the UN Committee on Torture on November 28. This entry was posted in News and tagged Civil Liberties/Civil Rights, Constitution, Convention Against Torture, Eighth Amendment, Federal Prisons, Geneva, hearing, Human Rights, International, International Agreements, Periodic Report, Psychological Effects, Solitary Confinement, Supermax Prisons, Torture, Torture, UN Committee on Torture, United States government. Bookmark the permalink. Mr. Fathi is correct. The U.S. government’s denials about its use of solitary confinement is shocking and disturbing.